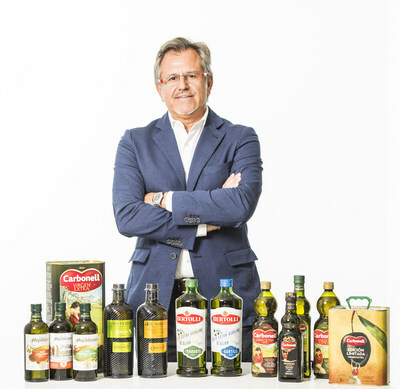 LONDON, May 15, 2018 /PRNewswire/ — Spain-based deOleo underscored its global supremacy in the production of top-quality olive oil by winning eight medals at the recent London International Olive Oil Competition, which is billed as Europe’s most prestigious competition for extra virgin olive oils. When the winners were announced last weekend, Bertolli “Black Label” scored Gold and Bertolli “Premium Edition” took the silver, while Carapelli achieved two silver medals with “125 Years Celebration” and “Founders Edition”. To crown the triumph, deOleo’s Spanish brands Carbonell and Hojiblanca scored three platinum medals. In blind tastings, the judges sampled 381 products from 21 countries over the course of three days. Bertolli Black Label has been described as strong and even “fearless” in the way it indulges in a deeply green grassy flavor. It combines green vegetables, tomato leaf, artichoke, banana peel and avocado notes, resulting in a pleasant bitterness combined with a long peppery finish. Black Label is a magical blend of the Picual, Picudo, Cobrançosa and Nocellara de Belice varieties, perfectly balanced to satisfy every palate. Carapelli 125 Years Celebration is an homage to the blender’s art and expertise. Crafted from the most refined, exquisite and carefully selected olives and olive oils and blended with the assured confidence of Carapelli’s “Maestry Oliari”, this limited edition is a very fresh oil with the aroma of fresh-cut grass, green banana, green almond, tomato and apple that perfectly match its hints of vanilla, wildflowers and citrus. There is a wonderful balance between bitterness and pungency, resulting in a truly harmonic olive oil. The grand finale is pleasantly bitter and persistently peppery. Top Carbonell “Magna Oliva” is an elixir of the most sophisticated aromas and textures, made specifically for those who will not settle for anything but the extraordinary. The flavor diversity of this oil is very wide, resulting in a rich and complex aroma profile: green leaves, new-cut grass, tomato, green almond, citrus and hints of aromatic herbs and mint. The balance between bitterness and pungency lends a very long-lasting taste.